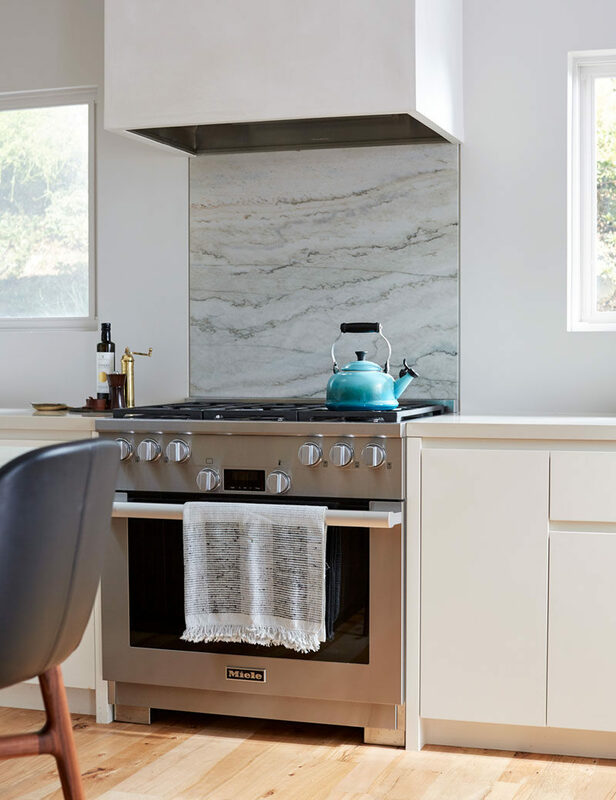 California-based BK Interior Design has completed the contemporary interior renovation of a home in the hills of Mill Valley, California, for their client, a well-traveled textile and jewelry designer. 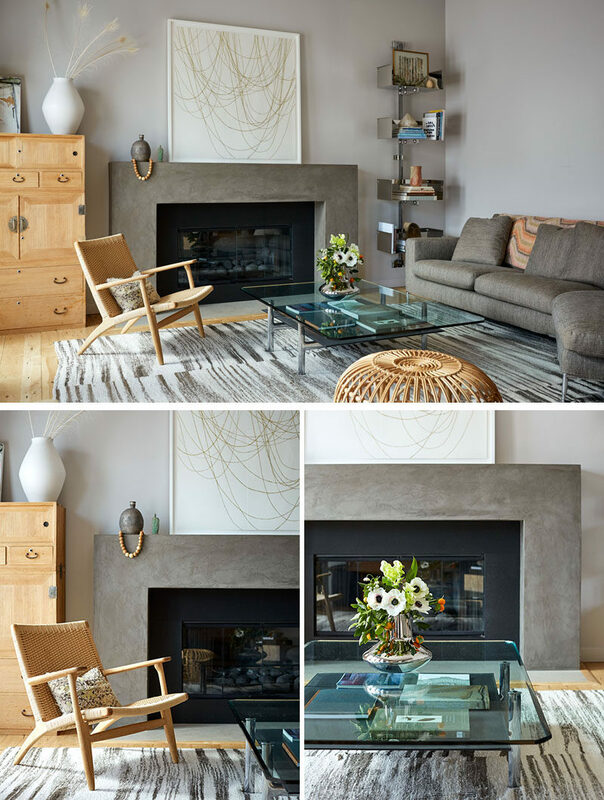 BK Interior Design aimed to create a bright, functional, and open space with a focus on premium materials and subtle details, to set the stage for their client’s collection of pottery, textiles, and art. 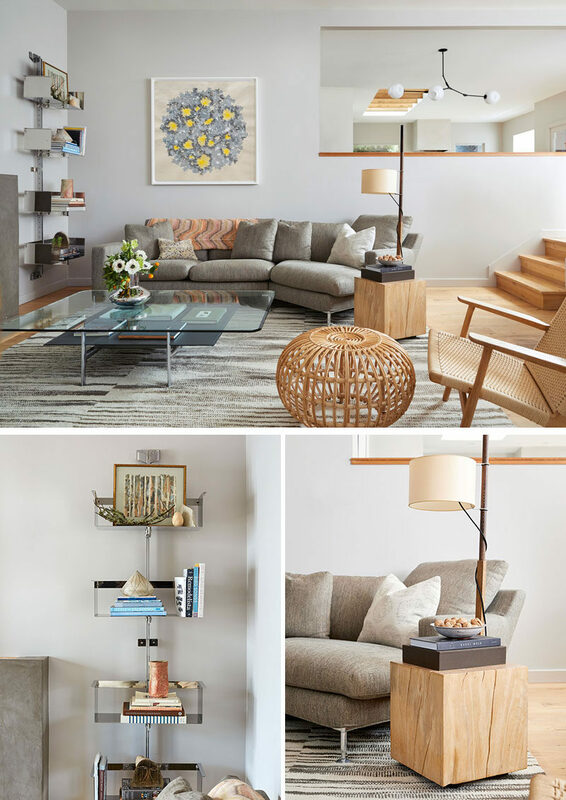 In the living room, BK Interior Design gave the space a fresh update, and worked together with their client to source additional elements such as the bookcase, rug, and other styling items to bring a clean and cohesive feel to her inspiring, eclectic vibe. 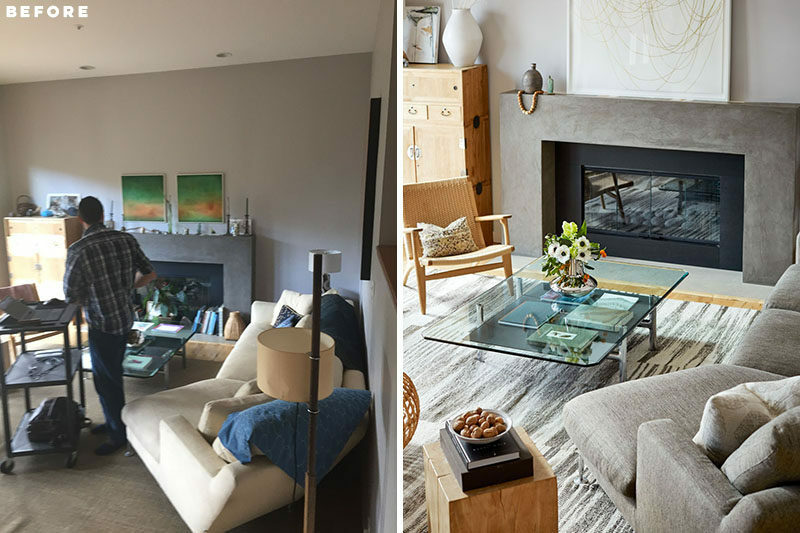 Furniture items such as a chrome-based coffee table, wall-mounted shelving, and an architectural lamp add places to display decorative objects. The kitchen before the renovation had a lot of cabinets, creating a heavy and cluttered feeling, and far from the ‘open concept’ kitchen that the home owner wanted. 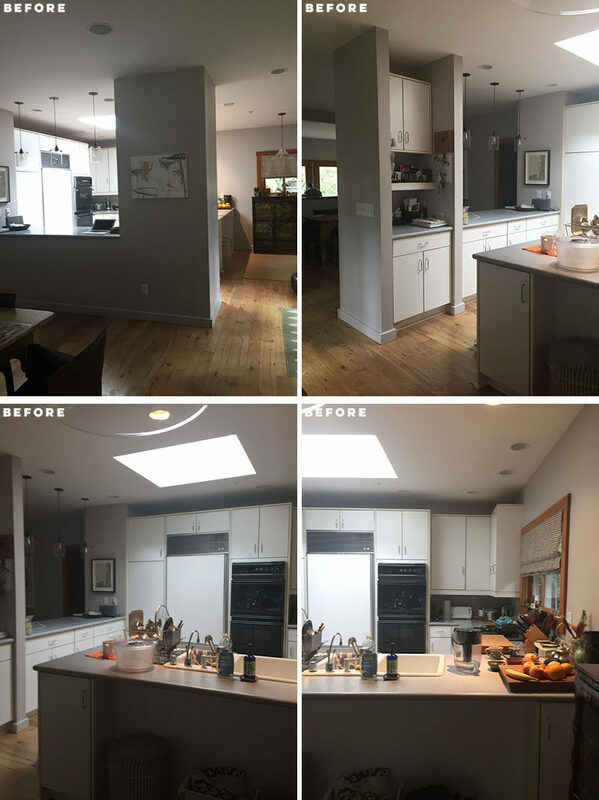 The kitchen was also very divided from the rest of the home, while a skylight was something that was to be kept and enhanced. 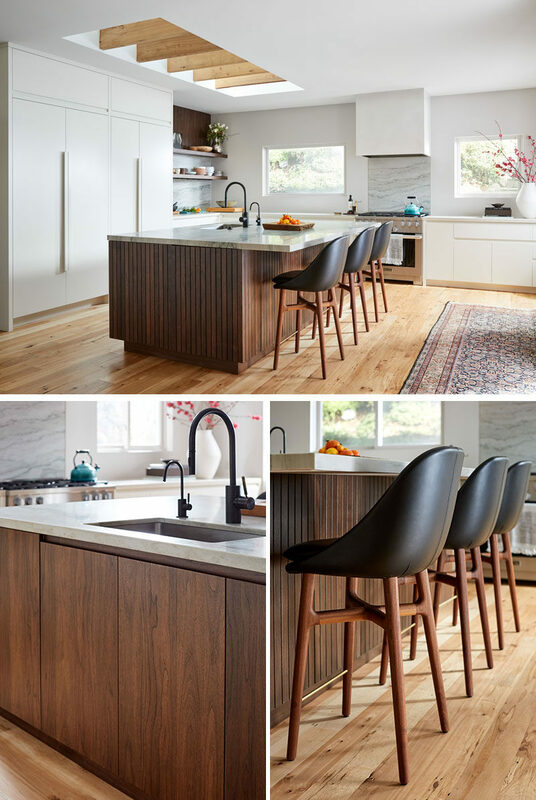 The designers fully remodeled the kitchen from the ground up, utilizing sleek, bright cabinetry, and various wood tones to keep the space grounded and warm. To reinforce the handmade and craftsman feel that the client wanted to retain, they installed walnut tambour on the island and above the open-shelving. The original skylight was enlarged and its new proportions mirror the size of the new island, while raw-edge rafters complement the reclaimed flooring material. A unique green quartzite counter and open-shelving back splash was added, reflecting the coloring of the lush, green surroundings of Mill Valley while retaining a clean, simple aesthetic. Recessed finger pulls instead of traditional hardware on the cabinets have been included to keep the look modern without being too cold. At the end of the kitchen, a small alcove with a window seat was given a fresh update with white window trims and a colorful blue cushioned bench. Below the seat, built-in storage has been added. Adjacent to the kitchen is the dining room. 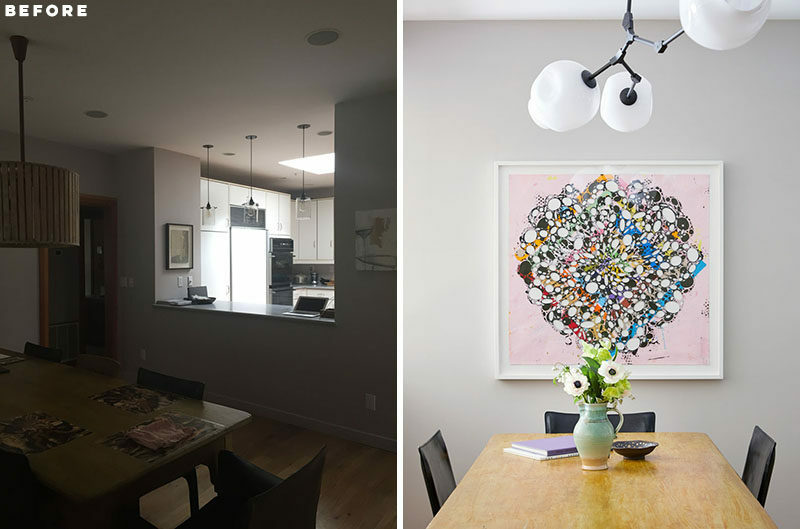 A new chandelier and artwork add to the overall contemporary design of the interior. 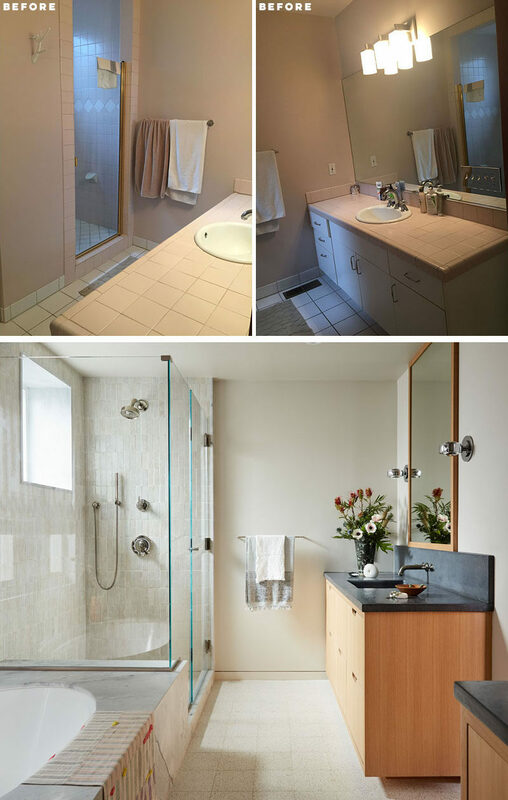 Another updated space in the home was the master bathroom and dressing room. The original bathroom had limited natural light, was very closed in, and was out of date with current trends. 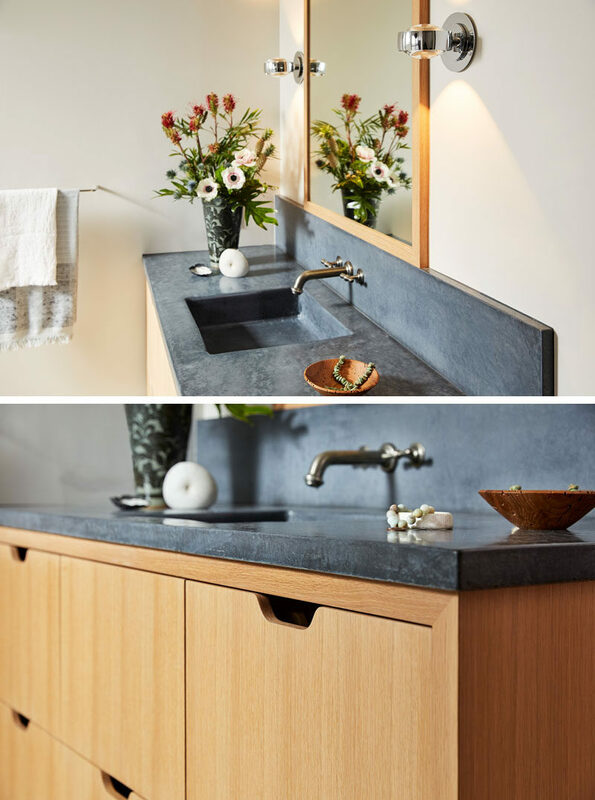 The new and open bathroom features a warm wood vanity with dark concrete counters. 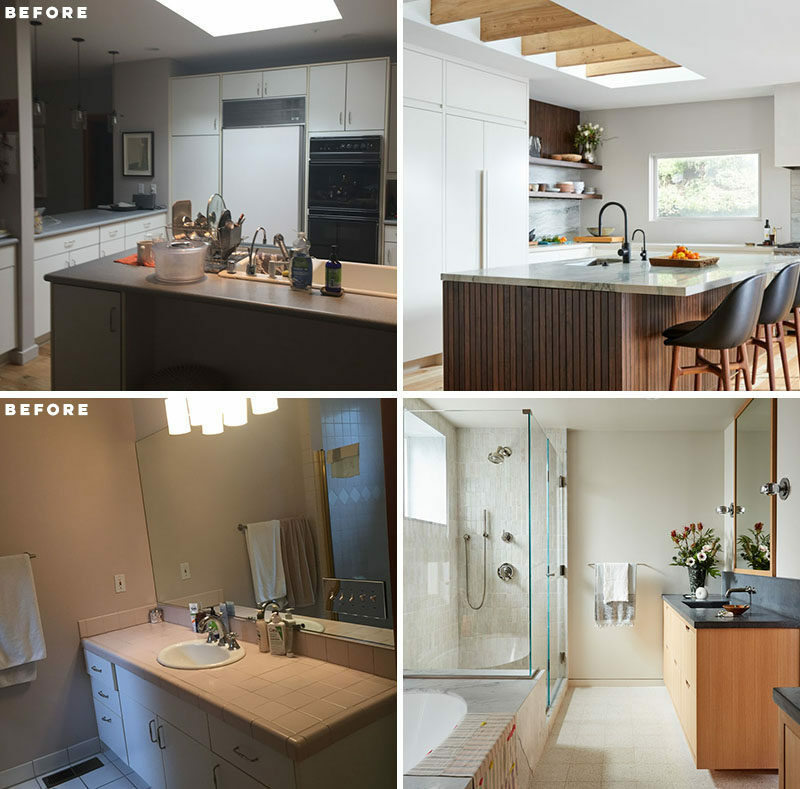 Soft pink tiles were replaced with light textured tiles, while the soaking tub is now the focal point of the bathroom. Outside the bathroom is the updated dressing area with light wood cabinets.